Hi guys, made a quick (took me a while actually lol) video to explain how to setup your AC server on Amazon Web Services for free! I might be tempted to do a lunix version if there's any interest and Kunos fixes the high cpu use on it in an update. 1. Go to aws.amazon.com and create an account if you don't already have one. You will need a valid credit card for any charges and a phone/mobile phone to verify you're real. 2. Once the account is created login to the Management Console with your email address and password you supplied when creating your account. 3. When logged in, change the region in the top right to Asia Pacific (Sydney), if you want to you can also change the Start Page to EC2. 4. Click on EC2 under "Compute & Networking" then under Create Instance click Launch Instance. 5. Tick Free tier only to see the corresponding AMIs and then scroll down and select Windows Server 2003 R2 Base 64-bit or a flavour of your choice. The instance type should automatically be selected as t2.micro, if this is not available make sure you have chosen a 64bit OS. 6. Leave the default settings for the instance details, if you wish you can tick Protect against accidental termination. Storage also leave it as default. Set the tags to whatever you like. 7. The Security Group is basically a firewall. Here you need to allow yourself to access the Remote Desktop of the server, choose "MyIP" under Source and your IP address will automatically be prefilled. If you have a dynamic IP address or wish to access the server remotely from other locations, add them manually. Create rules for the TCP and UDP traffic that is required for the Assetto Corsa server to function. These are TCP 8081, 8082, 9600 and UDP 9600. 8. Just before launching the instance you must create a key pair to access the server securely. Use a key you've made previously or create a new one, give it a name and save it to your computer. 9. Once the instance is launched you must wait around 5 minutes before you can access the server's Public IP username and Administrator password. Once you have these copied down you can access your server through Remote Desktop. Setup a few items on RD for ease of use.. I like to set an easy to use resolution and map some local drives that hold the Assetto Corsa files. 10. Connect to the server and copy over the server files from your local machine that you downloaded from Steam Tools. Turn off the windows firewall, configure the server and then run the acserver executable file to launch the server. Thanks alot dave will give this a go in the next day or so, I think there was no linux build in the latest version. Thanks heaps for the great write up dave, I have managed to configure a server with this quite easily now just going to test it out. I have tested my server but getting very high ping rates for some reason from 180 to 550 each time I refresh the server list. did have initial high CPU issue son it, but one of the previous updates fixed all that. Im assuming the way Dave said to set this up is the same way that Wally and Bird are doing their free servers but pings are much better on them. Not sure what is different also using Amazon t2.micro free server but this is also the first time I have tried so maybe I just screwed up somewhere even though I think I followed the guide set out in this thread. Nords is just a test as Id just like to have access to a server for days when wally isnt around. It looks much the same. The only difference is our small servers are on the old t1.micro instance, not t2.micro. I read that t2.micro resources are more shared with other users - maybe that's also true of network bandwidth. I didn't have to do anything else other than open the appropriate ports like Davo said. Make sure you have chosen Sydney and not the default Oregon region in AWS Console. The region sets the actual location of the server affecting pings dramatically. Mine was in sydney, I will have another go when I get home tonight but as it was it wasnt really useable. Make sure sleep time=1 is in your server config, I just ran into the same problem and the server would try to use 100% cpu and ping was 500+ms. 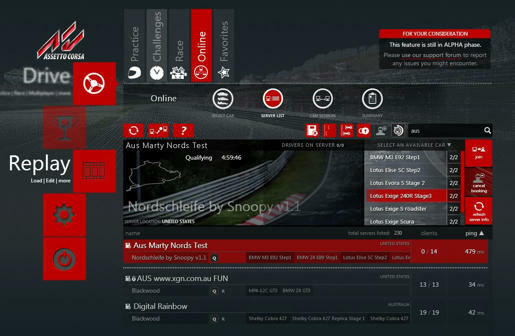 That was the problem seems to be sorted if anyone wants to test out the server its "Aus Public Server" GT3 at magione atm. I changed it to a t1 micro too not sure if that makes a difference or if it means is no longer free. I guess I will find out later about that. Seems to be working as it has been with the free XGN servers and had a few on, filled up with 12 max then I maxed it to 18 for the track and was going fine but started warping a little. I reset it turning off flow control and seems fine still but maybe need to lower client numbers as I wonder if it will properly handle 18 drivers. What's the best way to get a race result off the server? Does it get written to a file or do you have to connect to the web interface? The result file on the client side is always incomplete. I capture the server console output to a file, which I then parse. Thanks. Seems a bit silly that it doesn't log the results in a file like every other sim. Thanks for the tutorial Davo, ran through it at lunchtime, all went well until AWS had run out free resources in Asia Pacific zone... will try again tonight. There are two subnets, the default seems to be running out often - have you tried the other one ?